My Bronze Horseman Purgatory: Me Plugging "A Song in the Daylight"
Me Plugging "A Song in the Daylight"
Here is me plugging "A Song in the Daylight" during an Outlander video (my sister) Tracey and I made the other day. If anyone HAS read this book and is coming to tonight's Outlander Chat at 9PM Eastern...I will be there at 8:45 just itching to discuss! I'll try..............I'm in Central Canada..........I think it's 6:45pm our time? 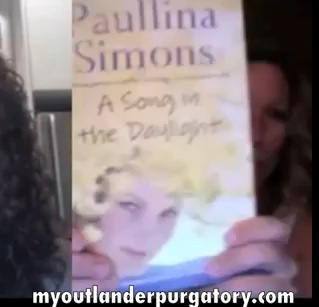 I created a blog dedicated to books Paullina Simons. The bronze horseman in Italy is called Il cavaliere d'inverno. The fans are always more numerous. Tania and Shura are in our hearts. I am creating a section dedicated to all the blogs and forums dedicated to Paullina Simons. Even foreign blogs. I'd like to do a link exchange.